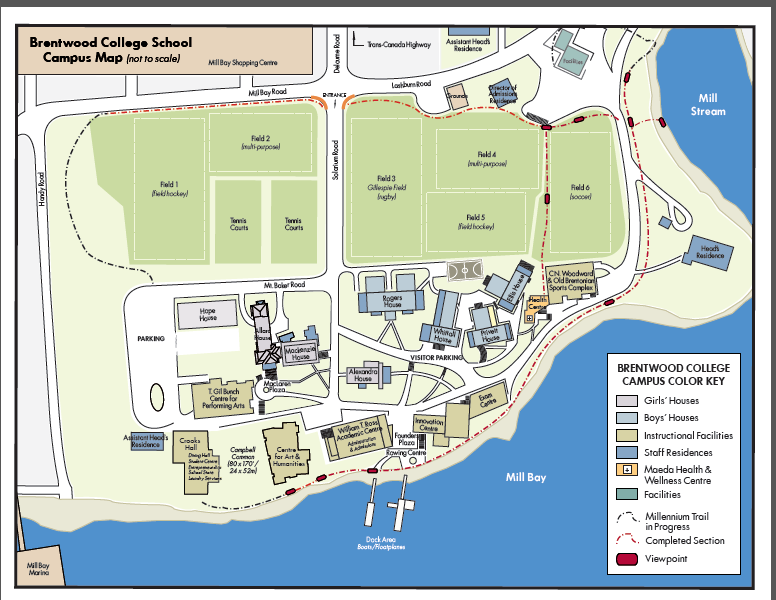 To get to the Brentwood campus (Google Maps), you must first come to Vancouver Island, either by ferry or by air. The school is an hour's drive from four major ferry terminals and the Victoria International Airport. Travel north on Highway 1. The road winds through the Goldstream gorge and climbs the Malahat summit. At the end of the Malahat are signs for Mill Bay. Go through two sets of traffic lights. These will take you past Butterfield and Frayne Roads. At the third traffic light at bottom of the hill, turn right, heading east towards the ocean. Before you turn, the Shell Gas Station will be on your left and the Mill Bay Shopping Centre on your right. Travel one block on Deloume Road to the stop sign. The Brentwood College campus begins just across the intersection, beyond the stop sign. Drive slowly through the brick portal, past playing fields on your left and tennis courts on your right. Proceed past the painted Brentwood College School sign and keep to the left. Visitors' parking is just ahead on the right. Walk down the steps towards the ocean to the William T. Ross Academic Block. This is where you will find the administrative offices. Welcome to Brentwood! Head South on Highway 1 toward Victoria. About 20km south of Duncan, there will be signs for Mill Bay. Go through the first set of traffic lights with the Petro Canada Gas Station on your right, and through the second set. At the third set of traffic lights, turn left, heading east towards the ocean. Before you turn, the Shell Gas Station will be on your right. Travel one block on Deloume Road with the Mill Bay Shopping Centre on your right to the stop sign. The Brentwood College campus begins just across the intersection, beyond the stop sign. Drive slowly through the brick portal, past playing fields on your left and tennis courts on your right. Proceed past the painted Brentwood College School sign and keep to the left. Visitors' parking is just ahead on the right. Walk down the steps towards the ocean to the William T. Ross Academic Block. This is where you will find the administrative offices. You've arrived: welcome! When you drive off the ferry, you will be on Mill Bay Road. Drive along this scenic oceanside route until you reach the Mill Bay Shopping Centre. You will see the Brentwood playing fields on your right. Turn right at the stop sign and drive slowly through the brick portal, past playing fields on your left and tennis courts on your right. Proceed past the painted Brentwood College School sign and keep to the left. Visitors' parking is just ahead on the right. Walk down the steps towards the ocean to the William T. Ross Academic Block. This is where you will find the administrative offices. You've arrived at Brentwood: welcome!